There’s a variety of components at play here. Firstly, there’s a Raspberry Pi, followed up by a simple IRF530 MOSFET, a PNP transistor to pull it low, a PIR sensor, and a strip of LEDs. It’s a a PIR sensor from Seeedstudio that I bought on a whim a while back. It handily runs off of 5v, and returns a 3.3v TTL compatible signal upon detection of movement. On the Raspberry Pi, I have my own Python app, mqtt-gpio-trigger, running. It continuously monitors pins that are defined in the config file, and in the event of a change of state of any of them it will publish a message to a predefined topic, with the pin number as the final component of the topic, and the message contains the state of the PIN. Simply subscribe to that topic to watch whatever pin on the Raspberry Pi. A strip of warm white LED lights are attached to pin 18 of the Raspberry Pi, via the IRF530 MOSFET. There’s a bog standard NPN transistor to help saturate the gate of the MOSFET, and it’s pin 18 as that’s the only pin on the Raspberry Pi that does hardware PWM. Using any of the other pins subjects you to vagaries of the CPU. Controlling pin 18 is mqtt-pwm-lights, another one of my scripts. It simply sits and runs, and subscribes to yet another MQTT topic. When it receives a message with a value between 0 and 512, it fades the lights to that value. Due to the NPN transistor it’s inverted, so 512 is off, and 0 is on. A minor annoyance, but the home automation controller handles that. So that’s it. 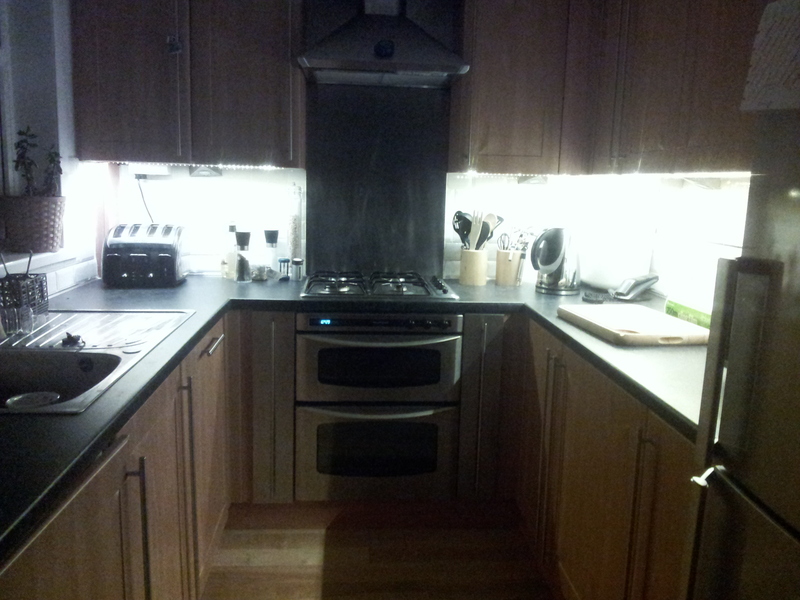 Ambient automated lighting for the kitchen, and worktop lighting, all rolled into one. Thought about using GPIO Edge Events/ interrupts instead of a loop? There’s quite a few of my MQTT things that should be marked as deprecated in favour of node-red. I know it’s not the same as a dedicated daemon service, but for my home automation tasks it fits the bill mostly these days.